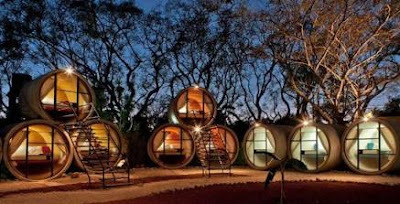 This unique hotel, called Tubohotel or "Tube Hotel" in English is an innovative hotel located in the middle of an orchard, in the village of Tepoztlán, Mexico. It's perfect for taking the family on a camping trip in style. With full amenities and a beautifully landscaped setting, it can make even the most skeptic ready to go camping.